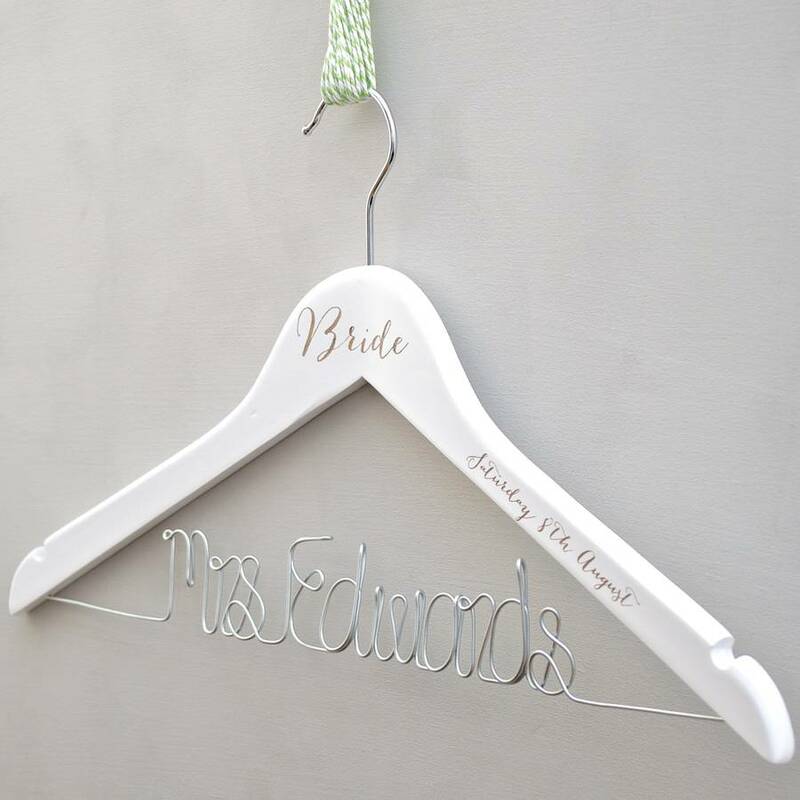 The ultimate combination of our award-winning wirework wedding hanger, with added engraved detail, to really stand out on the big day! 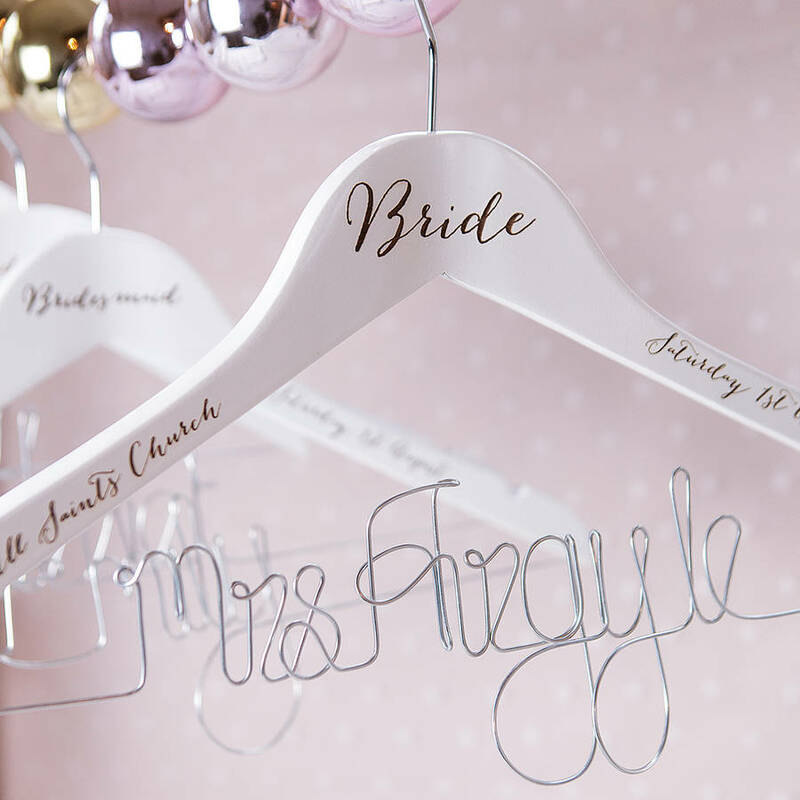 Tying the knot deserves a bespoke touch, and these personalised wire hangers afford the perfect gift, keepsake or decoration for your wedding. Perfect as an accessory for photos of the big day, and as a gift for the bride and members of the bridal party. 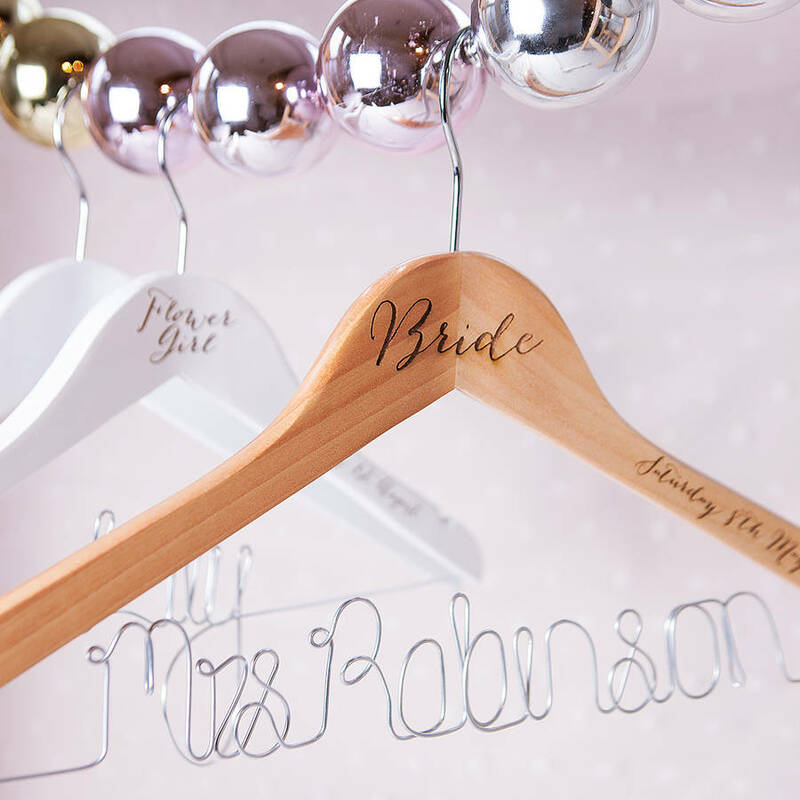 Hangers are classically wishbone in style, painted white wood with a chrome hook, ideal for supporting a heavy dress. 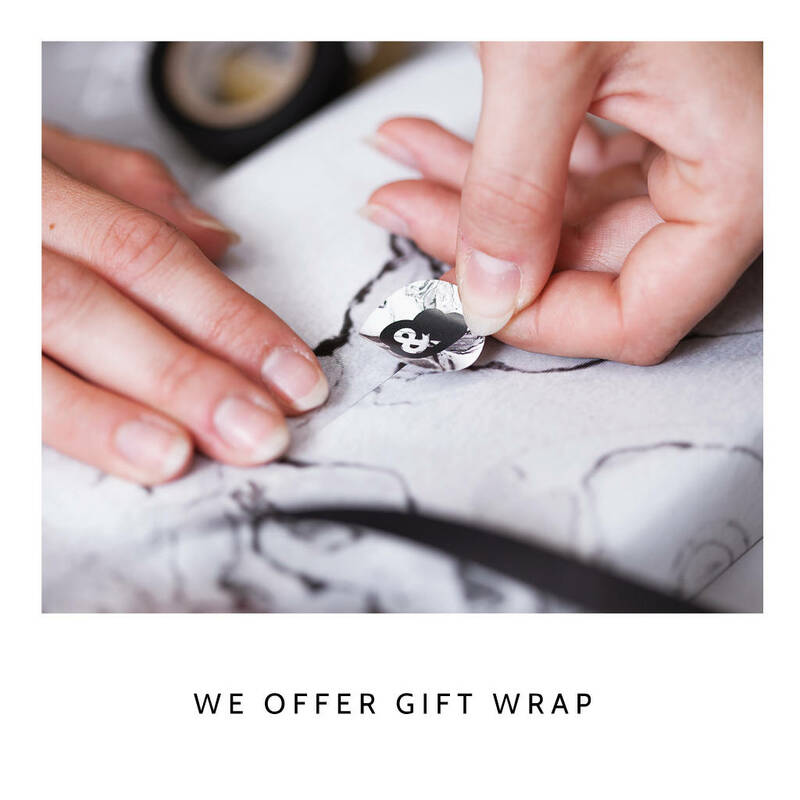 Need it gift wrapped? With our luxury double-sided gift wrap, you can choose which design your would like on display. Comes finished with black paper ribbon and a matching gift tag. 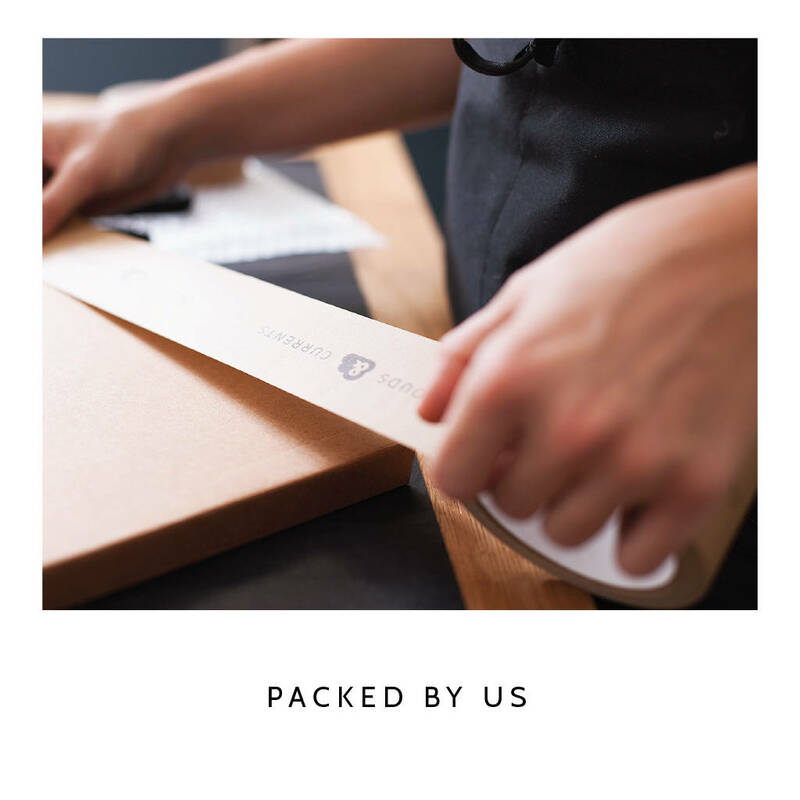 If your order is going directly to the recipient, why not opt for us to hand write the gift tag for you? 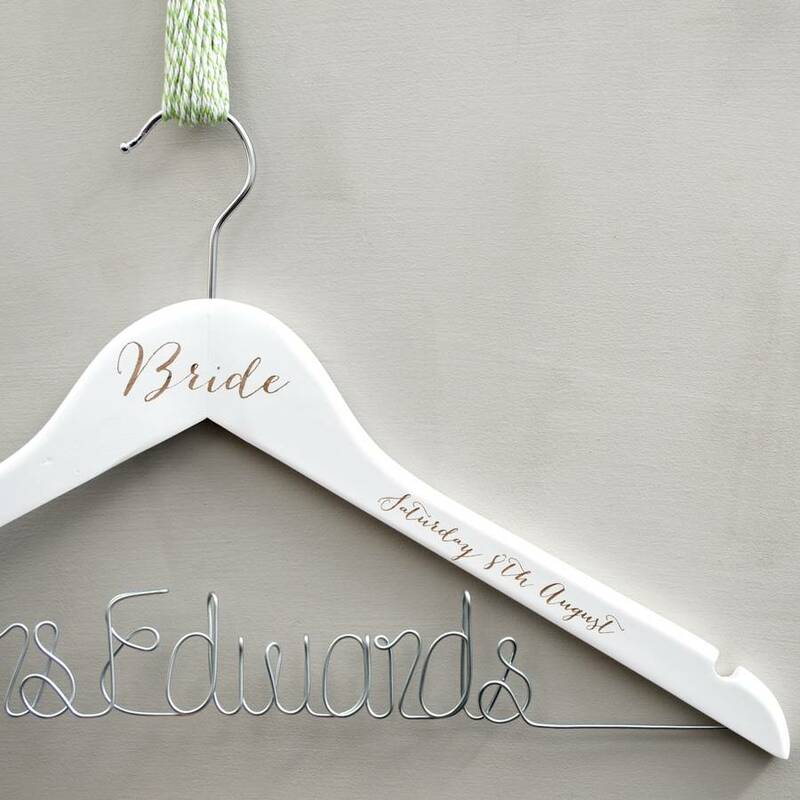 Make sure you view our full Personalised Wedding Hanger range, including our Grooms and Kids Hangers, by following the 'see seller's complete range' link on this page. The wire wording can be up to twelve characters long. 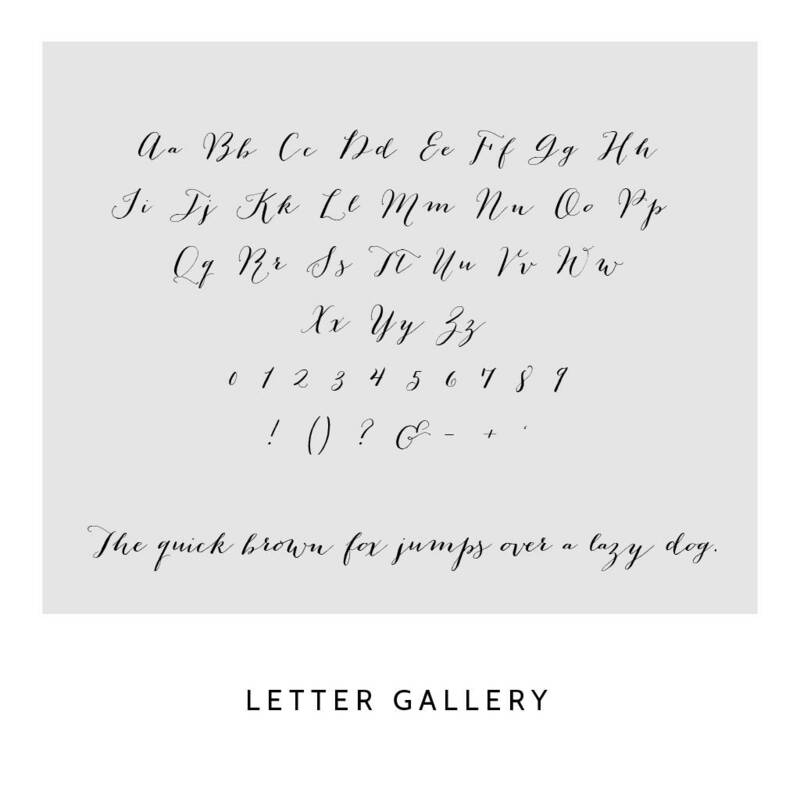 The wire will be crafted by hand in a cursive, joined-up handwriting font, and the way we form our letters is based on how the wire will look best overall. 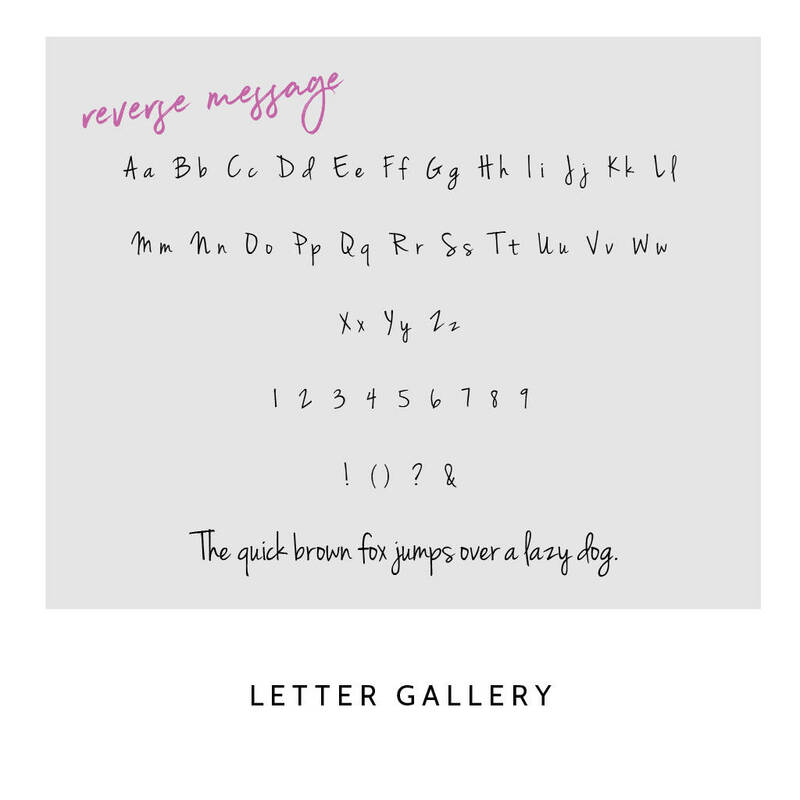 All letters in words will be joined, as the wire is one piece, and due to this we cannot include punctuation or accents. 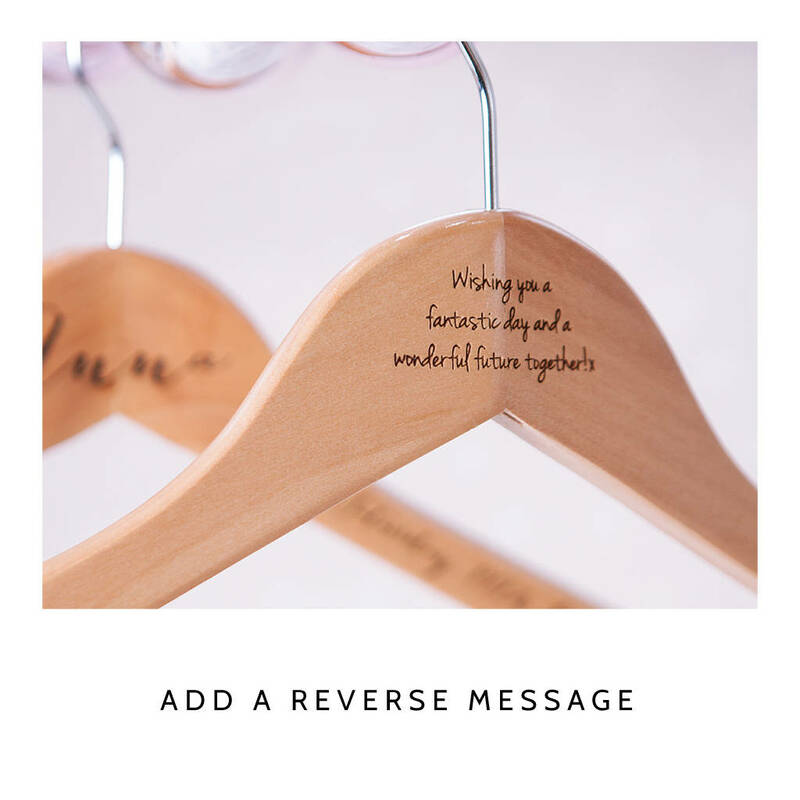 Handmade using Natural wood and engraved with typographic detail. 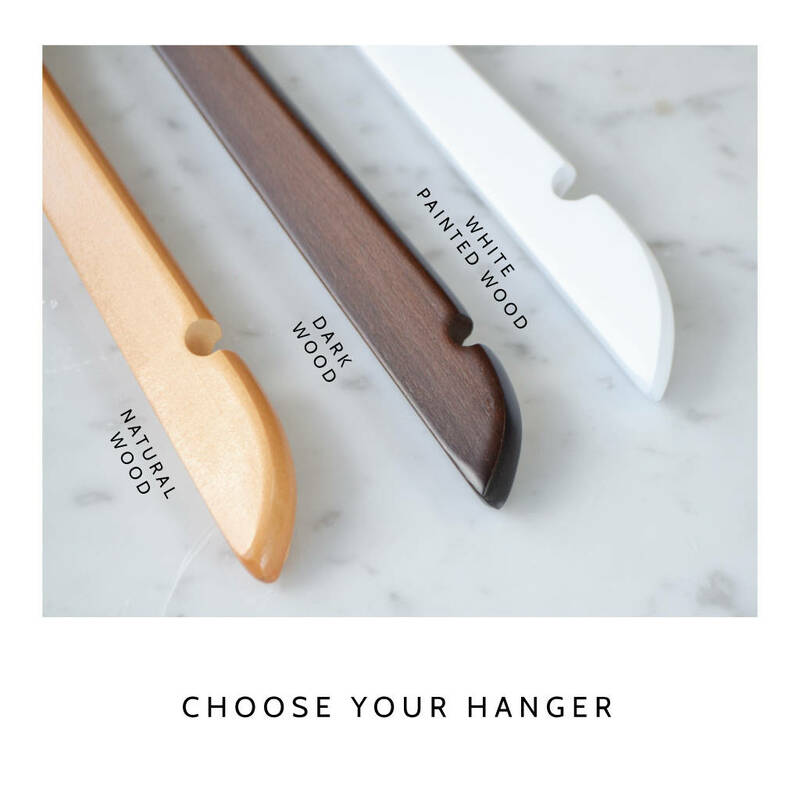 As our hangers are made from natural wood they may have indentations, bevels and grain, naturally occurring in wooden products. This product is dispatched to you by Clouds and Currents. Standard delivery is with Royal Mail and delivery time frames are estimated unless an Express Delivery option is chosen at the checkout. Express delivery requires a signature on delivery. If no one is available to accept delivery, the item will be taken to your local Royal Mail Collection office and a card left with instructions as to how to collect or rearrange delivery of your item.